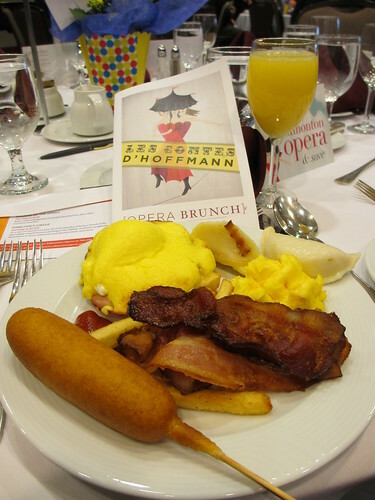 Two Sundays ago Mack and I were invited as guests to attend Edmonton Opera’s Opera Brunch for its upcoming mainstage production of Les Contes d’Hoffmann (The Tales of Hoffman). Though we’ve attended the opera and related events before (most recently, Storm the Stage last fall), this was our first time attending an event that would introduce us, in recital format, to the artists that would be performing in the show. Held in one of the banquet rooms at the Sutton Place Hotel, we were told that the buffet brunch would feature some dishes inspired by the production – namely, the circus setting where this production of Hoffman takes place. We were looking forward to seeing what the kitchen had in store. 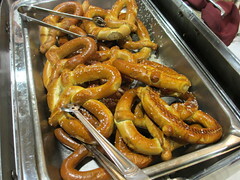 The first few chafing dishes revealed some summer fair favourites, including soft pretzels, corn dogs, fries and popcorn. But for those who wanted more traditional breakfast and lunch dishes, there was an overwhelming amount to choose from, ranging from eggs benedict, sausages and bacon to cold salads, roast chicken and perogies. It became obvious that some items fared better than others in the chafing dishes – the scrambled eggs remained fluffy and light, while poached eggs became overcooked, for example. The throwback to circus fare was also a mixed bag – we weren’t convinced the kitchen handmade the pretzels (and if they had, why wouldn’t they have sized them down into half or quarter portions? 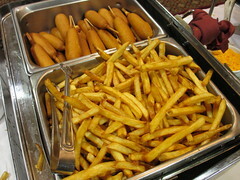 ), while the corn dogs were of the Pogo variety. I have to say the kitchen disappointed me that day – given we were told the food would be connected to the opera’s theme, I didn’t expect these feature dishes to come from a box. The service staff, on the other hand, were fabulous from beginning to end. We started out the morning with a mimosa (the champagne was topped up generously), and the coffee kept on coming. The performances began about an hour into the event. We would be treated to a total of ten songs, as well as some words from the Director, Designer and Maestro of Hoffman. Opera is often said to be pretentious, or at least inaccessible. Part of that is the language of opera, to be sure, but part of it too may be the physical distance between the players and the audience. Compared with a smaller, more intimate theatre production, it can be more difficult to connect with the performers. For me, the Opera Brunch helped erase some of that distance. Each of the ten artists chose to sing a song of their choosing, and many of them, surprisingly, were in English – no need for supertitles here! Before starting their song, they provided the audience with a bit of context (the scene preceding the song, the general storyline of the opera), so we were able to understand the character’s frame of mind, or the humour in the lyrics. What amazed me, sitting so close to the stage, was seeing the theatricality of the performers; their physical transformation into the character as soon as the music began – a hunch, a scowl – was a subtlety that sitting in the rafters at the Jubilee, I would never have noticed. And I don’t think anyone will disagree that the finale from Hoffman himself, David Pomeroy, who performed “Danny Boy”, was so wrought with emotion that there were more than a few handkerchiefs out at its conclusion. We also relished the opportunity to find out more about Hoffman, from the words of those working on it behind the scenes. The passion from Director Joel Ivany in particular was evident, as he described the difference between opera in North America and in Europe – in the former, it is presented as entertainment, in the latter, it is discussed and debated in the culture pages. As Ivany shared his vision for the opera, it convinced us that we should go and see Hoffman – I’m curious to see how the opera manifests itself. 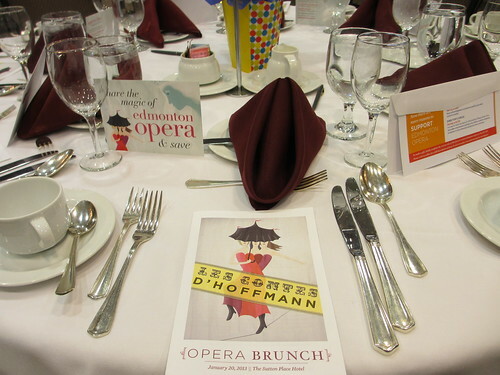 All told, the Opera Brunch was the best Edmonton Opera event I’ve ever attended. We were able to learn more about the forthcoming production, get to know the artists a bit more and listen to some wonderful music, all in an informal setting. I know the EO has tried to target a younger audience with the Explorer’s Club and Storm the Stage, but I think the framework of this event, transposed into an evening wine and cheese, would do more to help those 18-35 connect with opera. 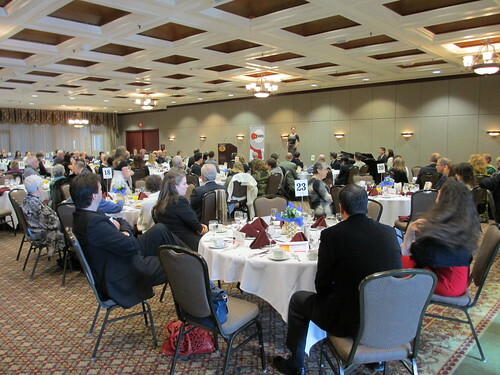 Thanks again to Edmonton Opera for the invitation! Les Contes d’Hoffmann runs at the Jubilee Auditorium on February 1, 3, 5 and 7, 2013.